The Gift is a series I enacted on my website to spotlight not necessarily unknown talent, but cats just under the radar. 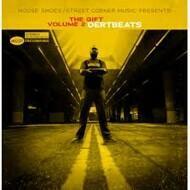 Enjoy THE GIFT VOLUME TWO, and once again if the music moves you go to his site www.dertbeats.com and cop sumn. These ain't for y'all to rhyme on either. If you want tracks contact him on the site and handle the business. I release these joints in good faith that y'all will respect and appreciate the music.